Although we didn’t lose any “big names” in 2017 like we did with Carrie Fisher and Kenny Baker last year, the folks who passed away this year all made their marks in indelible ways on the Star Wars galaxy we’ve known and thrilled to for the past forty years. 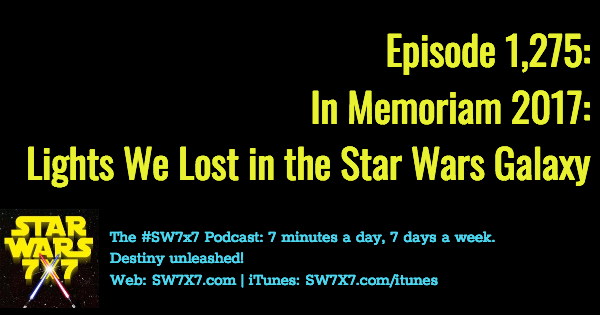 On today’s podcast, I’m naming and acknowledging their contributions in our special annual “In Memoriam” episode. It may also serve as a surprising reminder of the variety of talent and passion brought to bear in that galaxy far, far away.